Chris back in the day, sporting his full Buckstache. Need some good bulletin board material to help get your team focused for this week's game against tOSU? 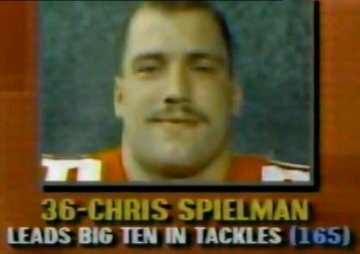 Well look no further than the former Buckeye and Detroit Lions linebacker Chris Spielman. "Look, one word of warning. Any time you've got an offense, you've got a puncher's chance. 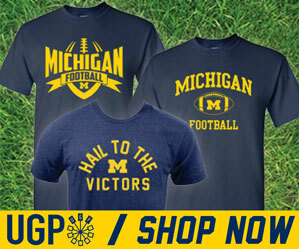 And Michigan has a puncher's chance against Ohio State. A lot of things got to go their way. Ohio State has to throw interceptions, they have to put the ball on the ground. But anytime you have … I think, really, he's the fastest football player that I've ever seen play in person, Denard Robinson. "That's the one thing, here's my warning if anybody is listening over at the (Ohio State football facility) Woody Hayes, here's my warning: You think he's fast. He looks fast on film. You don't know how fast this kid is until you see him play in person. And that's something that our guys are going to have to adjust to, because their offense is explosive, they can score points in a hurry, and it's going to be a challenge on our defense against their offense." "Now their defense on the other hand, it is the worst Michigan defense ever in the history of Michigan football in my opinion. They are so bad. They can't tackle. In my way of thinking, I don't know how they got this bad on defense. You look at Ohio State, when they lose players, we've had injuries, has this defense taken a noticeable step back? No. It still maintains. It still goes. "Everybody is saying, 'Well, they're all young, they're all coming back.' Well, yeah, they're all coming back. It's on the worst defense in the NCAA they're all coming back. Is that so exciting for you? It's bad. (Nose tackle Mike) Martin is the only guy that could start at Ohio State -- the only guy that could start. He would roll in there. He's a good player. But other than that, these guys would be excellent special teams guys. Very good on special teams. "It's not for lack of trying. They have a scheme, they can't execute the scheme. I'm not a big fan of the scheme because there's a lot of bubbles. And what I mean by that, there's just areas to run. They're not gap sound. They make a lot of mental errors. I think some of it is youth, but some of it's got to be talent, right? Here's the deal with this whole defense at Michigan, I mean, I think this, I'm pretty sure this is going to happen. There's going to be a huge evaluation of what direction they're going to go defensively. What do you want to do philosophically? What type of player are we going to recruit? Are we going to have walk-ons from outside of Toledo be our starting safety (Jordan Kovacs) or are we going to get kids who can play? "At Michigan you shouldn't have to play … and the kid's tough he plays hard, I love him, he's a battler, he's a warrior, all their kids play hard, they're Michigan kids, they're going to play hard, but that doesn't get it done at this level. When you have a team like Wisconsin that can line up and run the ball 34 out of 35 plays, 24 or 25 straight times down your throat and you know they're not changing and you can do absolutely nothing to stop it, you have a talent deficiency, and it's clear and evident that they do. (Michigan coach Rich Rodriguez) needs to reevaluate, 'What's our philosophy and what type of player are we going to get?' And we better get on our recruiting high horse and start going into living rooms and getting All-Americans and getting players that fit the Michigan defensive model that's been established over 100 years of talented players, NFL-ready type players who come in, play hard, play it with a level of tenacity and talent, which I'm used to seeing at Michigan. They had a defensive back (Charles Woodson) from Ohio who won the Heisman Trophy for crying out loud, the NFL MVP, they don't have any of those guys. Frankly, they don't have any of those guys on their roster. "It's a combination of poor recruiting, in my opinion, I think coach (Lloyd) Carr (who retired after the 2007 season), to be perfectly honest, left the cupboard bare in his last few years. I don't think they recruited the talent because you look at the upperclassmen that they have. They're all great kids. I had a chance to meet with a bunch of them. They practice hard, they play hard, and they're tough, but it comes down to one thing when you're talking about playing at a high level like Michigan is used to playing at, and that's talent. And they have zero on defense. One kid, the Martin kid. Other than that, a lot of guys would be nice little subs at Indiana." So there you have it. On many points I totally agree with him. He's 100% right about not adjusting to what Wisconsin was doing in the 2nd half. But, I think he got a little carried away at times, but that will happen when your a former Buckeye player talking about Michigan on a Columbus radio station to Buckeye fans. Like a drunken preacher talking to his blind choir. But he basically points out what we've been watching and talking about for the last 11 games.